Literally, the term "Buddha" means "enlightened one." According to Buddhist beliefs, however, there have been innumerable Buddhas over the eons. This section will look primarily at Sakyamuni, the historical founder of Buddhism. Sakyamuni was born around 500 BC in north India. As a young man, unsatisfied with his life of comfort and troubled by the suffering he saw around him, he left home to pursue spiritual goals. After trying a life of extreme asceticism, he found enlightenment while meditating under a tree. For the next forty-five years, he traveled through north India, preaching, attracting followers, and refuting adversaries. 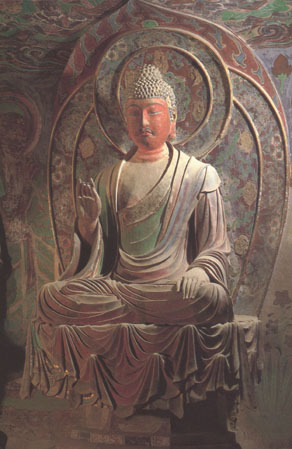 By the time Buddhism reached China, images of the Buddha played a major role in devotional practices. As you will see, the Buddha is usually depicted as austere in stature, pose, and dress. 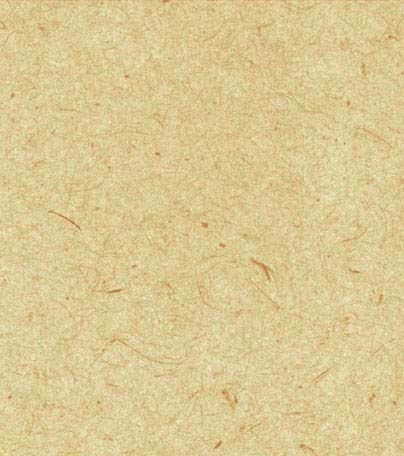 Otherworldly features are highlighted while human characteristics are de-emphasized. Mudras, or gestures performed with the hand, convey various actions. Here is a diagram of some of the more common mudras. In addition to the mudras, the Buddha is often depicted with other common conventions such as the lotus blossom, elongated ears, usnisa (the protrusion on the top of the head), and the urna (the raised dot in the middle of the forehead). These features refer to the life story of the historical Buddha. For example, the long earlobes remind one of the heavy ear ornaments the Buddha would have worn while still living in the palace. To the right is a Sixteen Kingdoms period (4th century) gilded bronze Buddha statue. What action does this mudra convey? 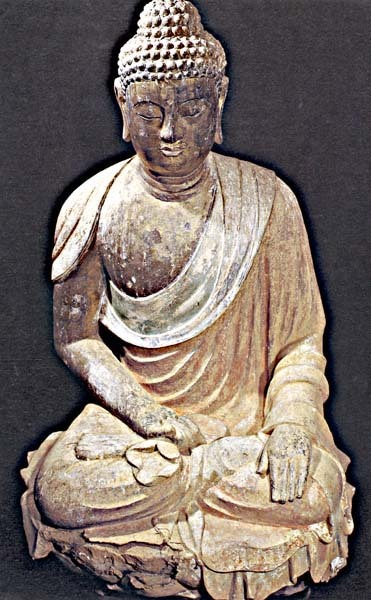 Early examples of Buddhist sculpture in China showed a greater Central Asian influence. What aspects of this figure reflect the early foreign influences? 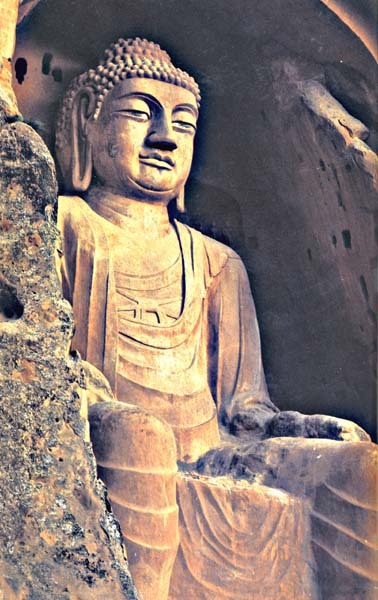 The seated Buddha to the left was carved from a stone cliff during the Northern Wei period. 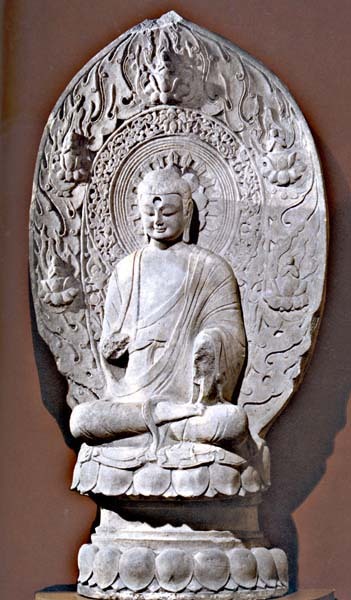 Which visual features are employed in this sculpture to identify the figure as the Buddha? What may the artist be trying to represent with these features? This standing stone Buddha is from the cave temple complex at Maijishan and dates to the Western Wei period. 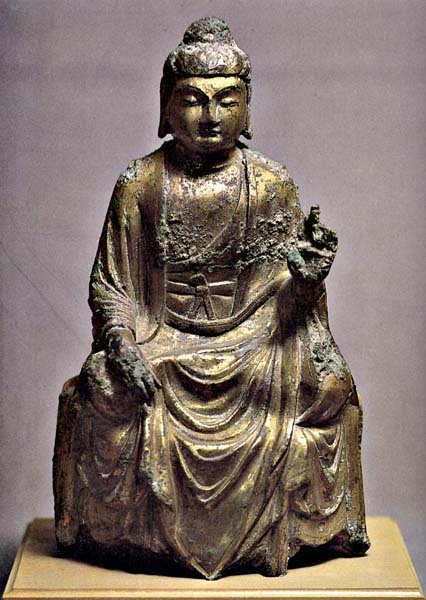 In comparison with the first Buddha presented in this section, what do you notice about the detail of the hair, face, and robes of this figure? 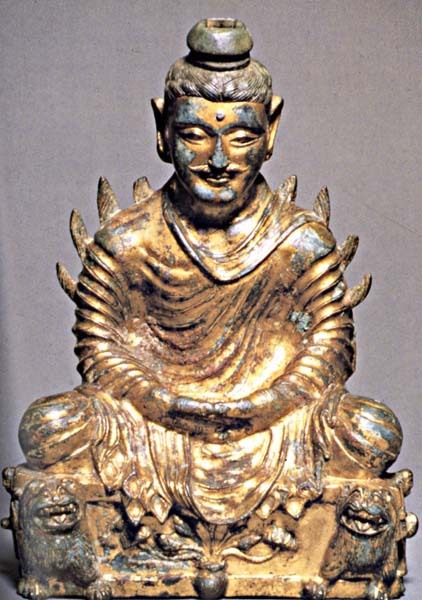 What does this Buddha figure appear to be sitting on? Do you see any other figures on the screen behind the Buddha? 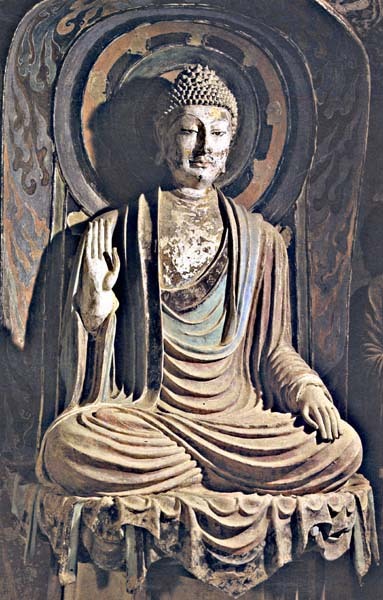 Someone has suggested that this clay Buddha from Dunhuang looks more like a noble person from the real world. Do you agree? What types of media were used to make the sculptures in this section? Why would different media be used? Compare the two images below. How are they different in style? Does one seem more decorative? If yes, how so? Does one seem more naturalistic?